Every year for the last 60 years, women from all around the world gather at the United Nations Headquarters in New York to discuss issues affecting women and develop strategies surrounding setting standards and formulating international conventions to change discriminatory legislation and foster global awareness of women’s issues. For 2 weeks women from governments around the world, civil society, national organizations, local non-profit organizations, come together to discuss how to shape global policies on gender equality, empowerment of women, etc. With several consultations leading up to the first ever World Humanitarian Summit (WHS) slated to be held in Istanbul, Turkey in May, there have been a call for change in the way the current humanitarian system works and responds. One of such calls that has resonated across most of the regions has been more localization of humanitarian response, more support to women organizations and women led organizations. In 2014 during the height of the Ebola virus outbreak in Liberia, the government of Liberia closed all schools in the country as an effort to help curb the spread of the Ebola virus. As a way to helping ensure that children were kept academically engaged, I led a team of volunteers who went to several communities in Liberia providing few educational packets to children so that they wouldn’t miss out on their lessons while schools were closed. This initiative led to over 7,000 children being reached in 7 months. I was invited to talk about the work we did during this Ebola crisis period and what we have been doing since. 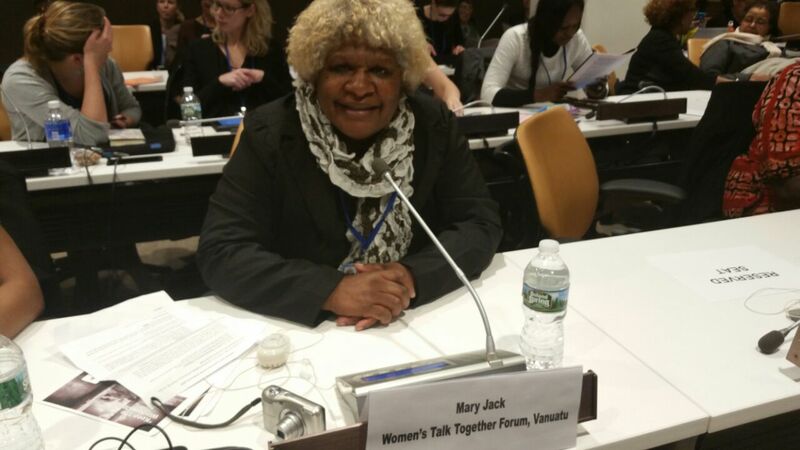 It was at this 60th CSW that I had the privilege of meeting Mary Jack Kaviamu, who along with other women from Liberia, the Philippines and Australia came to share their testimonies of the roles we played. We were provided an opportunity to share our stories and experiences as first responders and women leading local humanitarian action in our respective countries. Particularly during a time of crisis or disaster. And this is where I had the pleasure of meeting an amazing woman name Mary Jack. 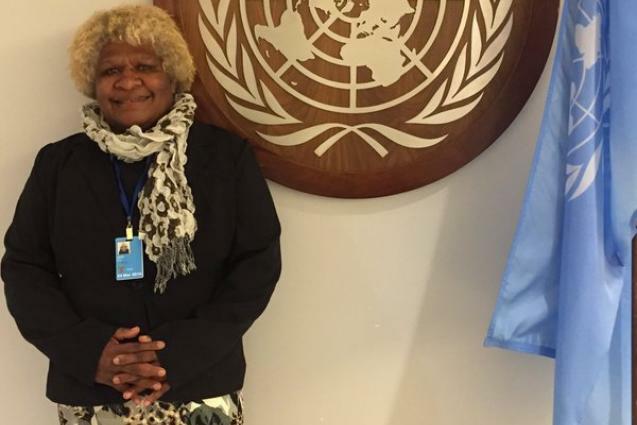 I learned quick quickly that beneath her quiet demeanor, soft spoken voice is a strong, resolved and committed woman who is passionate and committed to improving the status of women in her home in Vanuata. Over the next 6 days I got the chance to learn about her efforts (along with other women) in responding to the Cyclone Pam and what she has been doing before that and after that disaster when their homes and lives were affected. Mary delivered a powerfully, moving and emotional testimony at a side event organized by ActionAid and OCHA where we participated in the event ‘Women as First Responders’. Mary spoke about the level of violence against women in her country. Not just physical but emotional. Mary decided to break her country’s custom and run for a seat in the parliament. Currently the parliament has 52 seats, all occupied by men. It has been hard to see how a woman can break into that male dominated space. Men in her country see politics and parliament as a space reserved solely for men and the cultural norms is one that does not allow women to speak out. If a woman attempts to engage them in that space, her level of education is called into question, her wealth and many are told “this is not your place”. When Mary ran for Parliament, she received many threats and experienced emotional violence and although she didn’t win that election (357 women casted their votes and she got no male votes), she learned a lot from that journey. Mary though, is not discouraged and she intends to re-strategize and this time around intends to try at the local level. Elections though are expensive and she hope to get more support this time around to enable her go to more communities. Currently she is working with several women groups, mobilizing women to come together to speak for themselves and brining to the forefront to government the many issues they are facing. After Cyclone Pam, Mary realized that her home got damaged and that many other women had problems like hers and she volunteered to manage the space for women to come and share their stories. She organized training on human rights and women rights to have deeper understanding on their rights to be empowered to speak for themselves. Women in Vanuatu have less access to education to and girls are unable to complete schools due to resources. Mary has 3 children, two girls and one boy and tells me that she is proud to be a part of a movement to try to change this culture that compels women to be silent. She hopes that one day women in her country will be able to speak for themselves and break the custom and culture of silencing women. She has been involved in activism for 10 year and is not discouraged. She says that the tradition and culture has been a big barrier to women leadership. Women are not allowed to speak for themselves and she wants to take the opportunity to play a role that motivates women. To break this culture and custom. It is always amazing, motivating and inspirational when you hear the testimonies of other women and it reinforces to me how the role women play in development work, humanitarian responses and crisis period. The role women play, the narrative and image usually—so it’s refreshing to hear real stories of women taking leadership roles in unique situations.